Travel to Nepal and climb Putha Hiunchuli in Autumn 2019 with IMG! For years we had been looking for another high Himalayan mountain that can be climbed in the Autumn season without unreasonable avalanche hazard, and we're happy to say that Putha Hiunchuli (pronounced "POO-ta hoo-en-CHOO-lee") fit the bill. Our 2017 expedition went extremely well (7 of 9 clients with 5 guides and sherpas on top!) so we are looking forward to running the program again in 2019. If you're an adventurous climber who wants to climb a remote mountain in the Dhaulagiri Range, look no further! For the best possible chance of summiting this 7246-meter peak (23,773 feet) we will look to take advantage of the "window" of good weather that follows the end of the monsoon, but before the cold winter winds start picking up. 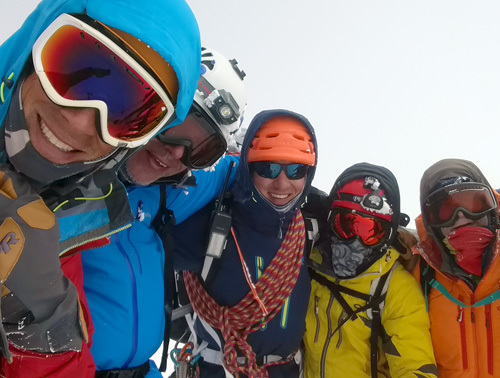 We are also going to use oxygen for summit day which proved to be very beneficial in 2017 to our team on a windy, cold summit day that saw other groups forced to turn back. This climb is going to be fantastic, giving you the opportunity to climb a big Himalayan mountain, become familiar with our great Sherpa team, and also gain experience using oxygen on the summit day. If an 8000-meter peak is in your future, we hope you will join us for Putha Hiunchuli. This will be great experience! Over the years, we have organized expeditions to many mountains in Nepal during the Autumn season including Hiunchuli, Singu Chuli, Tharpu Chuli, Baruntse, Mera, Imja Tse, Lobuche, Cholatse, Ama Dablam, Manaslu and Annapurna 4. As previously noted, the big issue in the Autumn Himalayan season is hitting the window between the end of the monsoon and the onset of winter, and dealing with the possibility of monsoon snowfall. With climbing in Tibet (Cho Oyu and Shishapangma) often curtailed by the Chinese, many climbers will try Manaslu, as IMG did back in 2012. On that trip our IMG climbers and Sherpas were all very fortunate not to be killed by the massive avalanche on Manaslu which claimed the lives of many other climbers. While a number of companies do still conduct expeditions to Manaslu, IMG has made the decision that we will not go back to Manaslu, as we are just not comfortable with the avalanche hazard on that peak. Avalanche issues are also a problem in the Autumn season on the other Nepal 8000'ers (Everest, Lhotse, Makalu, Dhaulagiri, Annapurna, and Kangchenjunga). These climbs are all better done in the spring season. Cho Oyu is very unique, perhaps the only 8000-meter peak that has historically been reasonably safe to climb in the Autumn season. We understand that Putha Hiunchuli is not an 8000-meter peak. We also know it is an excellent Autumn season objective that will offer amazing opportunities to climb high and gain additional experience. Our IMG staff will work with you on your technical climbing skills, as well as teach you the tricks for going to high altitude. This is perfect for climbers with Denali, Bolivia, Ecuador or Aconcagua under their belts who are ready for a real Himalayan expedition, or for our veteran Himalayan climbers who are missing the mountains and people of Nepal. Regardless, the experience you have on Putha Hiunchuli will be extremely valuable for future climbs in the Himalaya including Mount Everest. Our Autumn 2019 trip begins with a flight from Kathmandu to Nepalgunj, in western Nepal, and from there we fly north to Juphal, the jumping off point. Over the next week or so, we trek towards the east, gaining elevation. We will be camping along the way, with our Sherpa cook team preparing our meals. Eventually we enter the Bharbun Khola valley, that wraps around the north side of the Dhaulagiri range. This is in the Dolpo area of Nepal. It is remote, not crowded, and very spectacular. 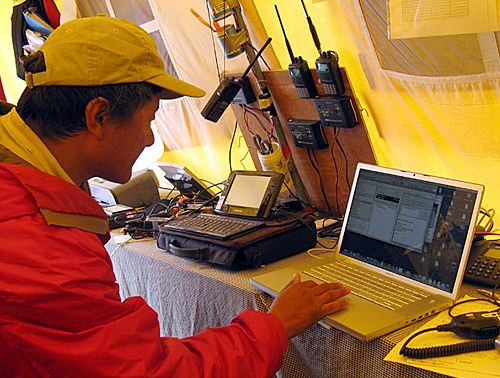 Base Camp is at about 4900 meters (16,000 feet). Above BC, we will establish two camps. The route is all on snow and ice. In addition to our IMG lead guide we will staff the program with our top IMG Sherpas. 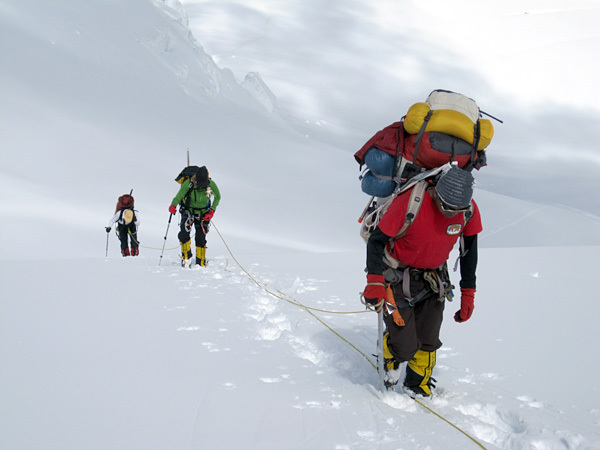 We will have high altitude climbing oxygen available starting from high camp, similar to how we climb Cho Oyu. 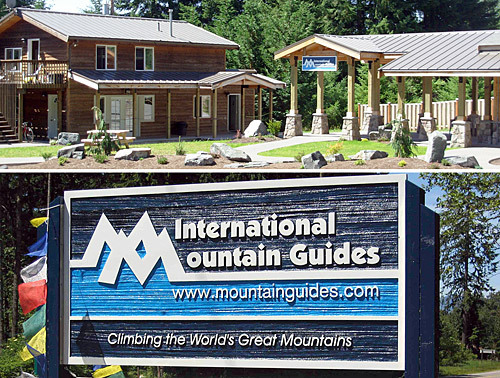 This is a great opportunity to practice for the 8000 meter peaks! Do you want a personal Sherpa? We can arrange that as well ($6000). 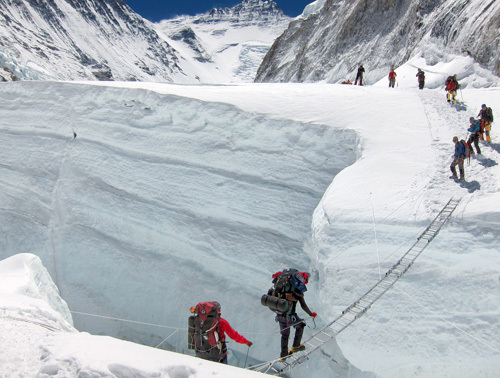 The cost for this program is $11,900 USD, which is a great price for a real old fashioned mountaineering expedition in a very remote region of Nepal. We are excited to run this program again and are looking forward to working with you on this expedition! The actual ending date is flexible, depending on weather and conditions. We have a number of contingency days built into the itinerary, but normally climbers will change their international departure flights when they know exactly when the expedition is going to end. We recommend adding seven days to this itinerary in case we must wait for weather or conditions. 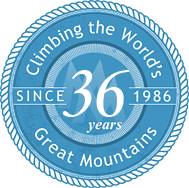 IMG is the oldest and most respected high-altitude climbing service in the world and its three principals, Eric Simonson, Phil Ershler, and George Dunn, have led and organized hundreds of expeditions worldwide since 1975. Each is an AMGA Certified Alpine Guide with Himalayan expedition experience. IMG's Himalayan mountaineering programs are organized and directed by Eric Simonson, one of the world's premiere expedition organizers. Under his direction IMG has conducted over 60 Himalayan 8000 meter expeditions, and since 1990, over 600 IMG team members have summited the world's classic 8,000-meter peaks, including Everest, Lhotse, Cho Oyu and Shishapangma. Ang Jangbu and his staff in Kathmandu puts together for IMG one of the very best Sherpa teams. We are proud to have a group of climbers working for us who are among the best paid, best led, best equipped, and best trained in the business. 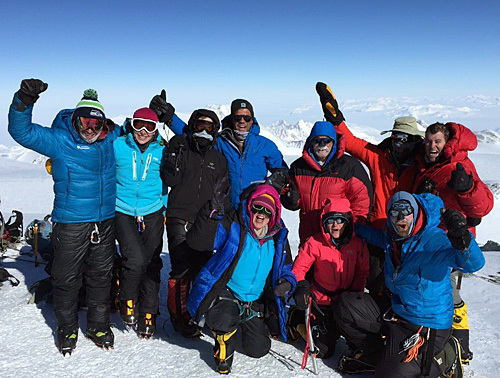 The Sherpa staff on the expedition have many 8,000m summits under their belt! Many of our Khumbu Sherpas do intensive technical skills training on an annual basis with some of the best American climbers in their home town of Phortse, through the Khumbu Climbing School. Do you want to take advantage of your acclimatization and climb Ama Dablam after you return to Kathmandu? 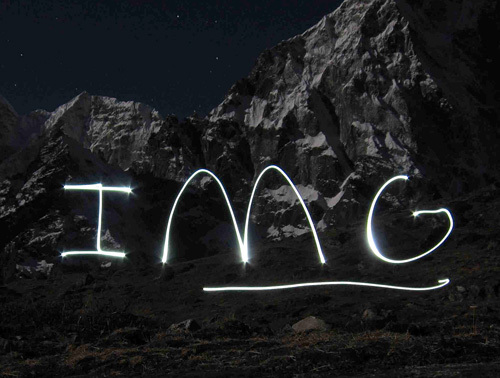 We can organize an accelerated Ama Dablam climb for you... let us know! How do I say Putha Hiunchuli? Putha Hiunchuli is pronounced "POO-ta hoo-en-CHOO-lee"
Account of the first ascent Churen Himal by the Japanese in 1972. Nice photograph of Putha Hiunchuli from the summit of Churen Himal. Everest history buffs might recognize the name of the climber Hasegawa, who in 1979 would speak to Chinese climber Wang Hongbau, just one day before Wang was killed in an avalanche on Everest. Wang described finding "English dead," and this clue would eventually lead to George Mallory.